Provost Julie Bernier of Plymouth State University sent me the above photo, taken at the PSU commencement ceremonies yesterday. 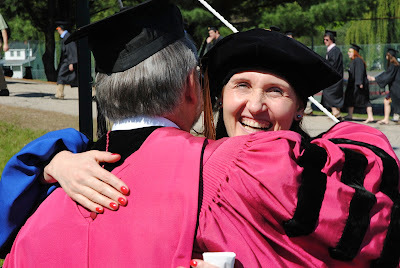 Your gray-haired old blogger is seen hugging Professor Dr. Roxana Dima Wright (din Braşov), who had just told me that she and her husband Rob Wright (from the U.K.) had become U.S. citizens the day before. Roxana was my student a decade ago, and has since earned her Ph.D., become a colleague, and risen to Director of Faculty of the College of Business Administration here at PSU. Professor Alexandra Muţiu, Ph.D., and Chuji Yamada, MBA. And here is Alexandra Muţiu, another Romanian colleague, with newly-minted Plymouth State MBA Chuji Yamada of Osaka, Japan. Chuji was my student this spring in New Ventures and Entrepreneurship, in which he developed a business plan for an agribusiness company with truly global potential. With Chuji is our good friend from UBB-Cluj, Prof. Dr. Alexandra Muţiu (din Oradea). Faithful readers have met Alexandra previously, and know that she has been serving our accounting students this term as a visiting professor. Today, Shirl and I sadly bid Alexandra "Goodbye," as she has begun her journey home to Cluj-Napoca. 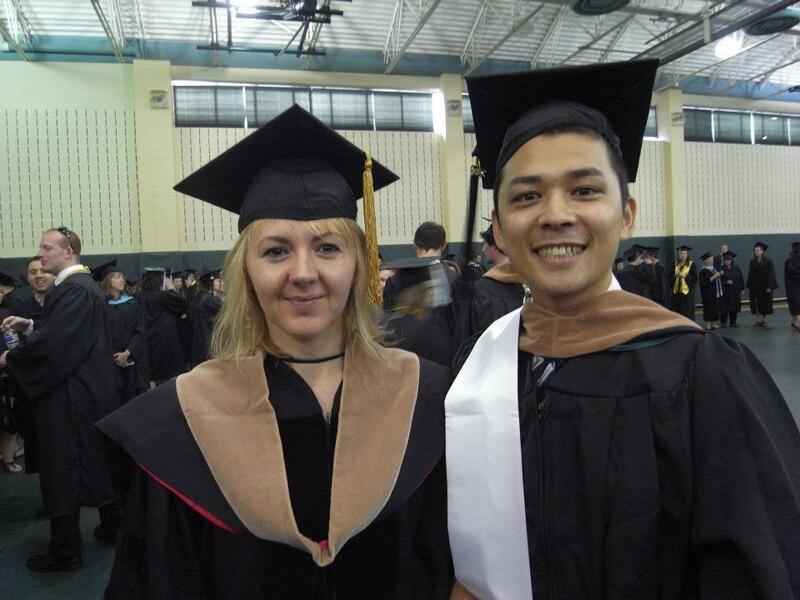 Raluca Tarcea, MBA, working on her studies in the N.H.R.S.H.H. in February, 2011. Also graduating yesterday, though unable to be present because she is already at home, working in Romania, was Ms. Raluca Tarcea, MBA, (din Cluj). Best wishes Ralu, in your new career! We will always have a place for you in our hearts, and in what you once so aptly termed the "New Hampshire Romanian Safe House Hotel." Alexandra: you are much missed in Plymouth!